The latest Steam Hardware Survey report has been published, giving us a look at the GPU market share & the top NVIDIA / AMD graphics cards being used by millions of gamers around the planet. In addition to Steam’s own hardware survey, a video has also surfaced which shows a histogram of the Steam Hardware Survey and the 15 top most used GPUs throughout several years. Over the years, Steam has become the most popular platform for PC gamers. 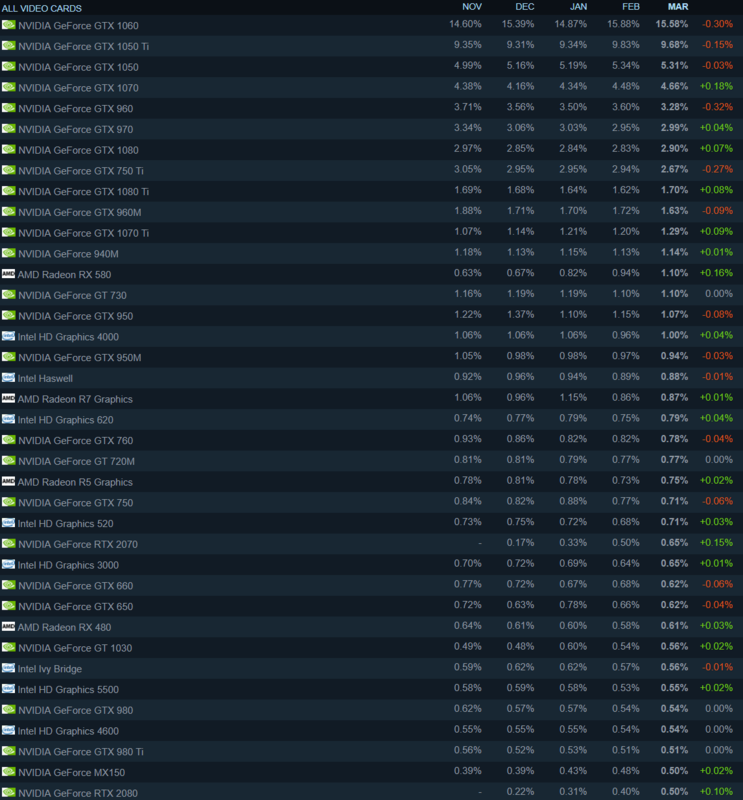 The popularity of Steam is mainly due to its large collection of gaming titles and a strong community that resides within it. There are around 125 million registered users on Steam with 90 million monthly active users as of October 2018. Surely it’s very popular and everyone wants a taste of the Steam formula which is why new competing PC gaming platforms/stores came to being (e.g. Epic Games Store, Uplay, Origin, etc). Now every month, Steam sends an opt-in survey form to a wide population of users to see what kind of hardware specifications they are running within their PCs. After compiling these numbers, they are added to the Steam Hardware Survey database. 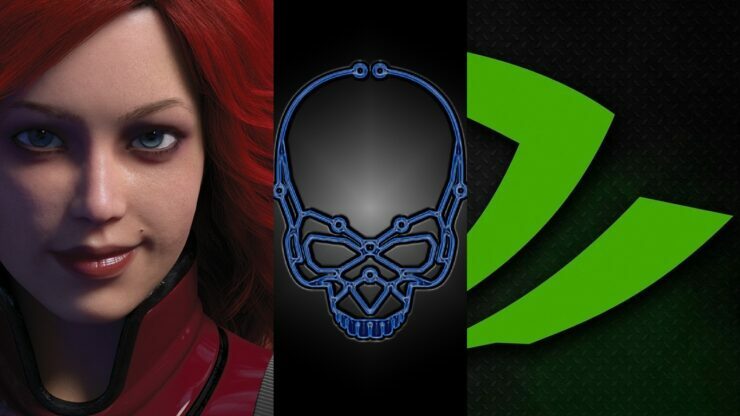 Now there has been some controversy behind how Steam conducts their Hardware Survey but over the past 4 months, I have personally received only 1 opt-in on my three gaming PCs, all of which are (NVIDIA GeForce and Intel Core) based setups. Now theories suggest that AMD platforms don’t get the opt-in survey form as often as Intel + NVIDIA based setups get. I haven’t tested that out myself but I think every theory should be proven before considering it as fact. It may definitely be an issue with the way steam conducts its survey but the numbers are interesting nonetheless and there are still a wide variety of NVIDIA and AMD hardware in the list which means they are definitely being accounted for in the surveys. Starting off with the video, it shows a timeline of the most popular graphics cards starting from April 2004 to all the way up till March 2019. We can see the performance of AMD and NVIDIA graphics cards were really consistent with both edging out their competitor each respective year until 2015 which is when NVIDIA introduced their Maxwell-based GeForce 900 series lineup. 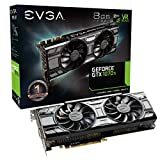 The GeForce GTX 970 and GeForce GTX 960 become so of the most popular graphics cards on Steam with many users buying them over competing cards. Another thing you’d notice is the strong lead of Intel HD Graphics which are basically IGPUs. For a large majority of the time, Intel’s survey would read the iGPU as a dedicated graphics unit even if the system was running a dedicated graphics board from NVIDIA or AMD. This fixed with the latest generation of Intel iGPUs. Currently, NVIDIA has complete dominance over Steam’s platform with the majority of gamers (74.75%) using GeForce cards, 14.9% using AMD cards, 10.21% relying on Intel iGPUs and 0.14% running cards from other manufacturers, presumably custom or older GPU. 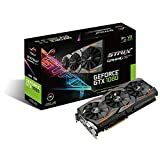 Now while the NVIDIA GeForce GTX 1060 (15.58%), GeForce GTX 1050 Ti (9.68%) and GeForce GTX 1050 (5.31%) are the 3 top most used graphics cards on Steam, it looks like they are seeing a small decline with GTX 1060 receiving the biggest hit of -0.30% from the 3 top most used cards. The GTX 960 is the one that actually saw the biggest hit of -0.32% and GTX 1080 saw a hit of -0.27%. At the same time, GTX 1070 continues to be popular with a +0.18% gain. Even AMD’s Radeon RX 580 saw a good +0.16% gain and now stands with a total share of 1.10%. 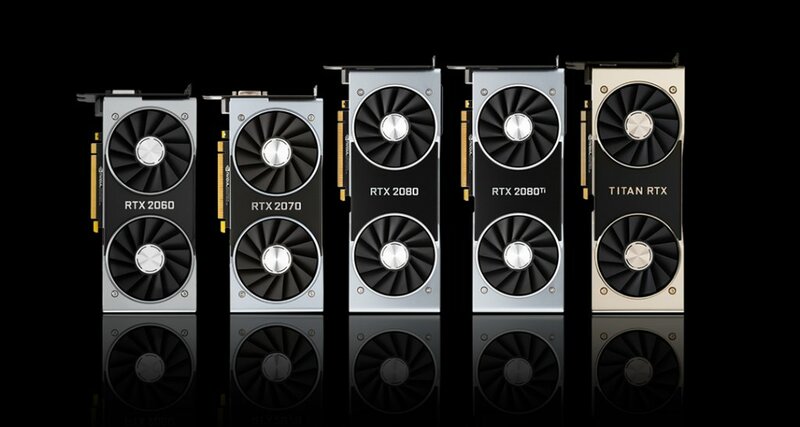 What’s interesting is that out of the newly launched GeForce RTX 20 series cards, the RTX 2060 saw a huge gain +0.27% which shows gamers interest in more mainstream GeForce cards as has been the case for a long time. The GeForce RTX 2070 saw a +0.15% gain, the RTX 2080 saw a +0.10% gain and the RTX 2080 Ti saw a 0.05% gain. 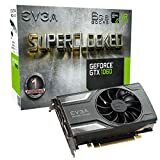 There are no GeForce 16 series cards listed right now since they are very new at the moment but we should see them enter the database next month. The 16 series cards may end up being the most popular of the Turing based GeForce lineup considering their highly competitive prices and good mainstream gaming performance. Other than Steam Hardware Survey, Oculus has also updated their hardware report for devices running their Rift VR headset and Oculus Software. It looks like Intel CPUs and NVIDIA GPUs are undisputed but the major difference is in the CPU market share. In March of Last year, AMD CPU share for Oculus was 10.9% while Intel’s share was 89.1%. No Ryzen CPUs appeared in the top 15 CPU list with the only AMD CPU being the AMD FX-8350. Now the report of March-April 2019 shows that AMD CPUs now hold 15.5% share while Intel’s share has declined to 84.5%. Both the AMD Ryzen 7 2700X and Ryzen 5 1600 appear in the top 15 CPU list. This aligns with our report that AMD is capturing major desktop PC (DIY/OEM) CPU market share. As for the GPU share, it’s pretty much the same story with NVIDIA retaining their dominant position with a share of 92.2% while AMD sitting with a 7.8% share. What’s worth noting is that 8 GB VRAM GPUs are very popular with a share of 47% while 4 GB VRAM GPUs amount for the 2nd highest share of 15.0%. 11 GB GPUs which include the likes of NVIDIA’s GeForce GTX 1080 Ti and GeForce RTX 2080 Ti amount for 11.6% share which is really good considering they almost match the share of 4 GB parts (sub $200 GPUs) despite costing more than $700 US. The various reports show that while Intel and AMD battle it out in the CPU department, NVIDIA leads the king’s position in the GPU department. AMD is doing well in the CPU department but I think it times the fix up their Radeon Technologies Group too. Intel iGPU Because Why Not?